Who’s On Top of the National League West? The Winter Meetings have come and gone, and the activity has not ceased. In the immediate aftermath of the Winter Meetings, the Chicago Cubs inked Jason Heyward to a eight year contract worth $184 million, while the San Francisco Giants added Johnny Cueto on a six year, $130 million deal. As the Winter Meetings and the immediate aftermath have shown, this has been one busy offseason, with a flurry of moves changing teams, and really entire divisions. Perhaps no division in all of baseball has seen as much movement as the National League West. At this point in the offseason, really the only team that hasn’t been busy is the Colorado Rockies, although that may chance with all of their starting outfielders seemingly available for trade. Every other team has made some big waves, and the National League West may look a lot different for the next several years. While the Dodgers were the class of the NL West in 2015, they have taken a clear backseat so far this offseason. Following another disappointing first round exit, questions swirled about the Dodgers immediate and long term future. At the top of the list of questions was whether Zack Greinke would opt out of his contract, and if so, would the Dodgers be able to bring him back to LA on a new contract? Once Greinke announced that he would be opting out of his contract, it became pretty clear that his decision would come down to the Dodgers and Giants. Just when it seemed that Greinke was getting closer to making a decision, a third team came in and stole the show. Enter the Arizona Diamondbacks. 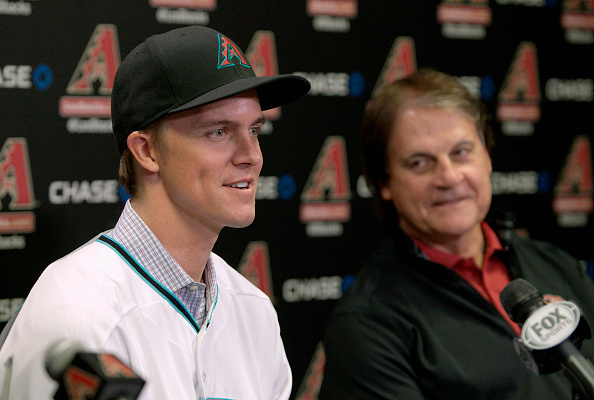 As was beautifully detailed in Ken Rosenthal’s piece about how the signing of Greinke came together, the Arizona Diamondbacks swooped in and, in a six-hour time span, convinced arguably the best pitcher in all of baseball to leave his former team, the Dodgers, and join the division rivals Diamondbacks. The Diamondbacks followed this big time move with a trade for Shelby Miller at the Winter Meetings, solidifying how serious they were about making the usually two team National League West a three team race. In the immediate aftermath of the loss of Greinke, the Dodgers got serious about a number of pitchers, including internal discussions about Johnny Cueto, but only managed to sign former Seattle right hander Hisashi Iwakuma, to a three year deal for a total of $45 million. While the Dodgers were doing that, the Giants made a splash of their own, signing former White Sox pitcher Jeff Samardzija to a five year contract worth $90 million. Now all eyes turned to Johnny Cueto, who was the last front of the line pitcher available. After turning down a six year offer for $126 million from the Arizona Diamondbacks, prior to the signing of Greinke and the acquisition of Miller, it appeared the Dodgers would be the team to beat when it came to signing Cueto. Boy were we ever wrong. Just when it seemed like the Dodgers would be the team to beat on Cueto, the San Francisco Giants came in and signed Cueto to a six year contract worth $130 million. Once again the Dodgers stood by and watched while their division rivals got that much better. While it remains to be seen why the Dodgers did not sign Cueto, clearly they have more financial clout, it still represents a loss for the Dodgers overall. Even though there are still quite a few difference makers left on the free agent pitching market, such as Scott Kazmir, Wei-Yin Chen, and Yovani Gallardo to name a few, the Dodgers have so far been beaten by two of their division rivals this offseason. The Giants and Diamondbacks both have taken big steps to get better, while the Dodgers have seemingly taken a step back with the loss of Zack Greinke. The National League West was due for a shakeup this offseason, and it’s gotten just that. The Dodgers went from the top of the West, in terms of both record and pitching, to perhaps the third best pitching staff in the division. It remains to be seen how the rest of the offseason will play out, but the Giants and Diamondbacks have put the Dodgers on notice. The National League West may not be a sea of Dodger blue for much longer.